This past weekend traffic was switched over to the newly constructed lanes of the Huey P Long Bridge. On Saturday contest winner, Gaynell Peterson, was selected to be the first person from the public to drive over the new lanes. 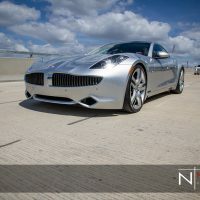 Thanks to Bergeron Motors, she got drive over the new lanes in a brand new Fisker Karma ES, an extended range electric car that cost a whopping $100K. It really was a sweet looking car! For more photos go to my Facebook Page and Like Us. I will post the photos from the Last Over the New Lanes tomorrow so check back.